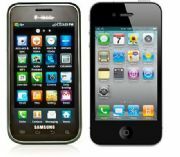 Samsung has vowed revenge over Apple's recent lawsuit against the electronics maker that claims Samsung "slavishly" copied Apple's iOS devices for its line of Android-based Galaxy smartphones and tablets. Apple is reportedly miffed at Samsung for taking technologies and design ideas such as organizing application icons into grids and making smartphones with rounded corners. "Rather than innovate ... Samsung chose to copy Apple's technology, user interface, and innovative style in these infringing products," Apple argued in its filing. Samsung isn't taking the charge lightly and says it will "respond actively to this legal action," according to Agence France-Presse. Samsung's Vibrant phone and Apple's iPhone. Apple's charges include 10 claims of patent infringement, two of trademark violation and two of trade dress (appearance and packaging) violations. While Apple may have a point about design copying, the big question is whether its claims of patent infringement will hold up. Apple may also be forced to settle with Samsung since there's a good chance Apple will end up under fire from Samsung over similar charges of patent infringement. "We [Samsung] think Apple has violated our patents in communications standards. We are considering a counterclaim," a Samsung spokesperson told Seoul's Yonhap News Agency. Samsung is one of Apple's largest suppliers of computer components such as processors and RAM. The Seoul-based electronics maker may also soon be Apple's supplier for iPad display panels, according to All Things D.
Technology companies often sue each other over patent infringement, a practice referred to as competition through litigation. Many big companies also stockpile patents in order to fend off infringement claims from competing companies. The basic concept of this defense is "mutual patent destruction." In other words, if you sue me into oblivion, I'll do the same to you. Google recently said it felt it had to stockpile patents in order to defend itself and its partners from claims of patent infringement over products such as the Android mobile OS. The search giant announced in early April it had made the leading bid for Nortel's patent portfolio during the Toronto-based company's bankruptcy auction. If successful, Google hopes its bid for Nortel's 6,000 patents will "create a disincentive for others to sue Google, but also help us, our partners and the open source community continue to innovate." Nortel was a leading telecommunications manufacturer until it declared bankruptcy in 2009 after years of losses, restructuring, layoffs and a 2004 accounting scandal. Apple's strike against Samsung is just its latest round of litigation. Apple is also involved in legal wrangling with HTC, another Android device maker, as well as Nokia over patent infringement. Nokia and HTC are also suing Apple for patent infringement. Apple is suing Amazon over the term "App Store" claiming Amazon's Appstore for Android violates an Apple trademark. Microsoft, meanwhile, is fighting to stop Apple over rights to the name "App Store," claiming the term is too generic to be worthy of a trademark. Motorola and Apple set off a legal battle over patent infringement in late 2010. Motorola filed a complaint with the United States International Trade Commission arguing that Apple violated 18 of its patents, and Apple later accused Motorola of infringing on six of its patents.